The Rim Fire of the late summer 2013 reached the Tioga road. 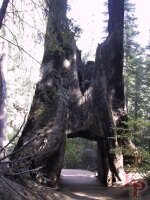 Due to fire damage and danger of falling trees, Tuolumne Grove has had some work done. Due to the fire and general wear, there was construction on Tioga Road for 2015. While fire has always been a part of the cycle in the Sierra Nevada forest, this was a human caused fire, not a natural fire. The forest will return eventually. By 2017, there were some signs of the fire, and a lot of signs of recovery. The high road through Tuolumne provides the easiest access to a high Alpine meadow in the Sierra. From the east you have a long steep climb to the park boundary at Tioga Pass -- a relatively low pass over the Sierra, which is why the road was built. Then the Tuolumne meadow area with the campground and visitor center. Tenaya Lake is a good place for starting an interesting hike to Clouds Rest (and continuing to the valley if your car can drive itself). Olmstead Point gives you a view of Half Dome and is the critical avalanche zone for the snow plows every spring. The road continues down into the forest and Crane Flat. Many trailheads start from the road, which saves hikers from the long climb up from the valley floor. Winter and spring are possible only on skis or snow shoes, but summer and early fall are great times to visit and get away from the crowds. Especially fall when facilities are closing and there is no overnight parking allowed on the road -- once it snows the road is closed (closures range from October 17 (a rare event) to December 11 (there is the very late January 17, 2012 closing), but most closing dates are in November). Through the fall a snow may close the road, but a week of sunshine opens it again, but without that week, it stays closed. Recently a summer shuttle has operated from Olmstead Point to Tuolumne Lodge. Perfect for arranging day hikes when staying at the Lodge or the campground. 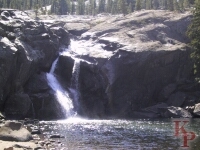 Tuolumne is the largest alpine meadow in the Sierra, also the most accessible and most crowded. But compared to Yosemite Valley, or much of Yellowstone, it is deserted. Even more so in the winter when it is under several feet of snow. If you get out of your car and start walking you quickly leave the people behind. Snow steadily accumulates with each winter storm, then steadily and quickly melts to feed the streams and falls. The meadow itself provides San Francisco with subdized water. San Francisco pays nothing to protect the important watershed. Below the meadow, Hetch Hetchy has been destroyed by San Francisco to produce power that is mostly sold to make money for the city. 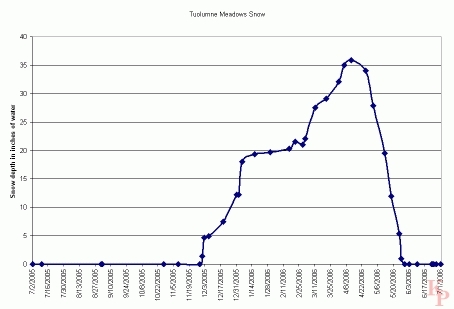 More water storage is available lower in the Tuolumne basin at Don Pedro. Olmstead Point provides a different view of Half Dome. The higher Clouds Rest (to the left) provides even better views. This is one of the critical zones for opening the road each spring -- with the large expanse of bare rock it is prime avalanches terrain. Walk out to the views that are a bit beyond the parking lot. For stereo views, see Olmstead Point Stereo The smooth granite slabs are ideal for spring avalanches which can delay plowing operations. 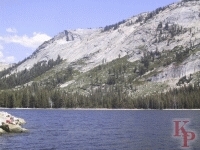 Tenaya Lake, which feeds Tenaya Creek (and eventually Mirror Lake), provides a good break along the road. No motorized boats are allowed in the park so the lake is quiet (except for the road traffic). Strictly speaking Tenaya Lake is not part of Tuolumne, it is in the Merced drainage, but it is on the Tioga Road. Glen Aulin (11 miles round-trip from the road), one of the High Sierra Camps, is along the Tuolumne River and the Pacific Crest Trail. The cascade makes it a beautiful setting. The High Sierra Camps provide one way for people to experience the back country without the effort, but they require luck and advance planning (enter the lottery in the winter). Occasionally, in extreme years the camps do not open due to the late snow melt. From here the trail follows the Tuolumne River through the Grand Canyon of the Tuolumne River (not to be confused with the Grand Canyon) down almost to the Hetch Hetchy Reservoir but skirts well above the lake to the Hetch Hetchy entrance station. Along the trails, the peaks surrounding Tuolumne provide outstanding backdrops for the river. From the road, take one of the trails up or down stream. Once you are away from the road the crowds thin out and you can enjoy the scenery away from cars. Pothole Dome with its easy walk up the rock lets you have an overview of the meadow to the east. Pothole is the western limit of the meadow and easily reached from the road. Not too far past here you cross the not very obvious divide between the Tuolumne and the Merced (or locally, the Tenaya). Gaylor Peak stands on the Sierra Crest, on the opposite side of Tioga Pass from Mt. Dana. 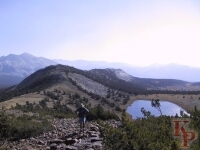 From here you have views to the east (Mono Lake region) and to the west toward Tuolumne Meadow. 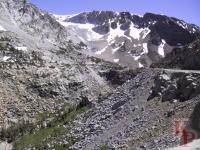 Tioga Pass requires a long steep climb from Lee Vinning and Mono Lake. Modern cars have no real problems, but rental campers can be a problem. C Initially closed due to the Rim Fire in the summer of 2013, but available again. Though not really on the Tioga road (parking is off the Tioga road near the begining -- or in the winter, just before the closure) -- it is on the old road to Big Oak Flat, which is now a walking path -- the Tuolumne Grove is a quiet place to see Sequoias. Including what is left of a Tunnel Tree. Mariposa Grove on the southern edge of the park is larger and more accessible (and thus more crowded, but access there will be restricted for trail reconstruction and rerouting begining in 2015).